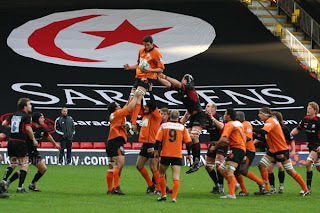 You can see more pictures from that game at rugbypix.com, as usual. So Saracens are on course for a great half term report, having won their pool in the European Rugby Cup, which means they get a home Quarter Final. They play Glasow Warriors again (having beaten them once in Watford and drawn the return leg at Glasgow), on the last weekend in March. They also beat London Irish 19-8 at Watford on 28th Jan, meaning they move up to 5th in the Premiership table, heady heights indeed! Plus, they have one match in hand as they still have to play the postponed game against Irish at Reading on the third weekend of March. Meanwhile, I'm looking forward to the Six Nations games this coming weekend. Especially with the return of Jonny at No. 10 and the inclusion of Andy Farrell at 12! Well worth watching. Dave Woods asks if Faz's presence will encourage some of our League brethren to watch the match too. After a break for Christmas and the New Year, I shall resume normal service for 2007, blogging and blethering to myself. If anyone's listening, that's great. And talking of Christmas, if you're now suffering from the excesses of the Festive Season, you might raise a chuckle at the Halfbakery's suggestion of a Trolley For Dieters. Now, on to the rugby... what's been happening since I last posted? Brian Ashton got the job as England Head Coach (I'm sure you know that already). He's now picked his squad for the Six Nations and beyond, naming Phil Vickery as Captain [see right]. Some surprises in the squad - Billy Whizz is back from International retirement. Lawrence Dallaglio doesn't even make it into the England Saxons squad. Jonny Wilkinson gets the nod as one of three No. 10's, but is still not fully fit from his last injury and isn't likely to be playable for the first game against Scotland. Meanwhile, Sarries have been doing OK over the break. They beat Quins away on 22nd, and Northampton at home on 27th December, but lost away at Leicester on New Year's Day. As of now they sit at 5th in the Premiership table. Heady heights indeed - let's hope they can keep it up in the second half of the season! My next visit will be for their home game against Narbonne (European Challenge Cup match) on 14th January - so I'll post some photos after that.